Beautifully crafted ceramic incense stick holder – made exclusively for holding/burning your Murphy’s Naturals Mosquito Repellent Incense Sticks. To best repel mosquitoes, light Murphy's Naturals Mosquito Incense Sticks on your patio or deck 10 minutes prior to your outdoor activity. Hold the Murphy's Naturals Mosquito Incense Stick down at an angle and light the end until there is a flame (about 15 seconds). Allow end to flame for 10-20 seconds, then blow out. A wisp of natural incense repellent will come from the end of the stick. Place stick in ceramic incense holder. Ensure the green incense does not touch things that may catch fire. The end of the burning incense stick and the ash is hot, see Incense Stick WARNING instructions. Always burn on a flat surface. 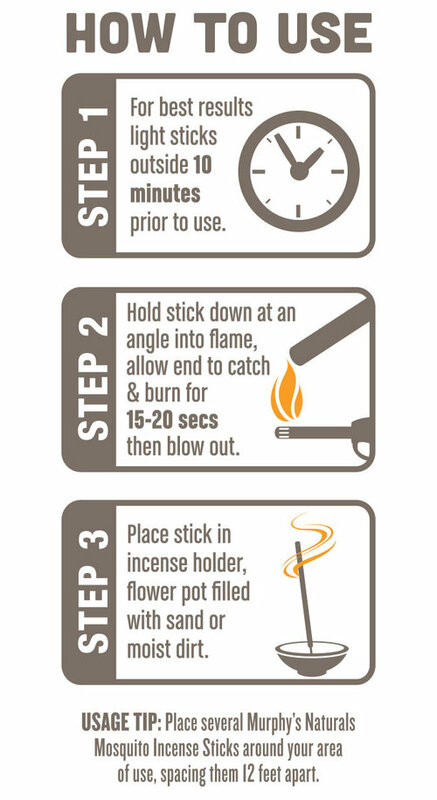 Place stick so there is no danger of it lighting foliage or other things that catch fire. Do not let green incense touch things that may catch fire.